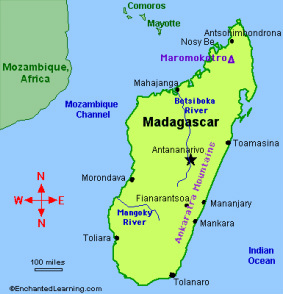 Madagascar is located off the southeast coast of Africa in the Indian Ocean. It is the fourth largest island in the world and home to 5% of the world's plant and animal species. Such species include the lemur primate, the fossa, the chameleon, 3 bird families, and 6 baobab species (all of which are endemic to Madagascar). Madagascar is considered the world's top conservation priority. People started inhabiting the island about 2000 years ago along the Indian Ocean trade routes. As a result, the Malagasy language has more in common with their origins in Southeast Asia than with the African continent. Malagasy Music combines the traditional folk music of the island and influences of the cultures that thrive in and around the island nation. Each region of the island specializes in a particular kind of music. The uniqueness of Malagasy music lies in its balance of tradition and modernity. Music of Madagascar is played to the tunes of various musical instruments such as the flute, valiha, harmonica, kobosy, amponga, and kiritsana.